For over 47 years we have been a Company of leadership and diversity. Our success is due to the over 170 talented employees that work in our Corporate offices in Macon, GA or branch locations throughout the Southeast. Branch locations encompass 6 States and 13 Locations. Branch offices located in Atlanta, Georgia or Chattanooga, Tennessee; Mobile or Birmingham, Alabama; Jacksonville, Florida; Raleigh, Charlotte, or Hickory North Carolina; Memphis or Knoxville, Tennessee; or Jackson, Mississippi. Our sales engineers and service technicians participate in on-going training to keep them up to date on the latest technology and engineering changes in the industrial community. Our employees are our most valued commodity and we believe that a happy employee is a loyal and productive employee. Subsequently, our management team’s 75 years combined experience in executive management has directly contributed to our low employee turnover rate. We welcome you to explore this section and see if we are a company where you can grow both professionally and personally. 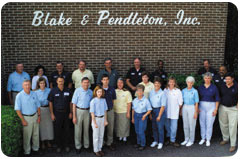 *Blake & Pendleton, Inc. is committed to a policy of equal employment opportunities to all employees and applicants for employment without regard to race, color, religion, gender, age, national origin, or any other factors protected by law. All applicants must be able to perform the essential physical functions for the applied position. Blake & Pendleton is also committed to maintaining a drug free work place All applicants are subject to a pre-employment physical, drug screen and background check.